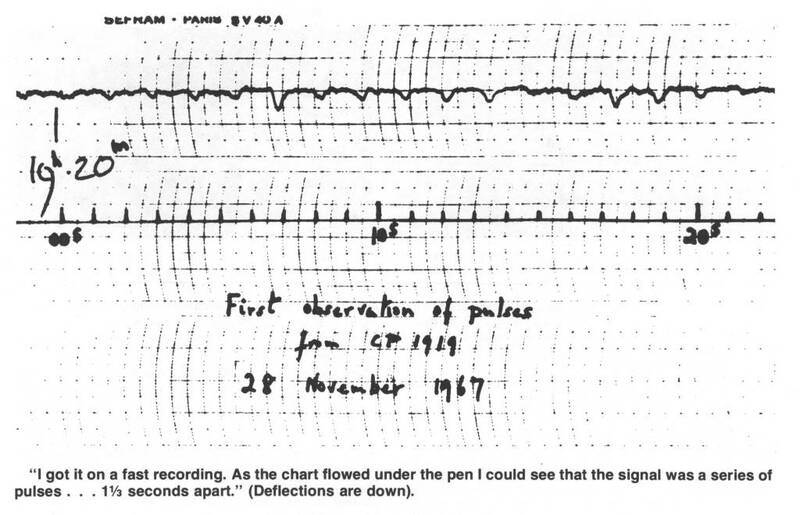 About fifty years ago, a young Jocelyn Bell was reviewing her daily dose of radio data — 30 meters of data printed on chart paper which had to be tediously scanned. She found something very odd: a pulse in the data that repeated every few seconds. This astronomical phenomenon quickly became the hottest topic of the late 60’s: Were these signals terrestrial? Little Green Men? We later learned that these radio pulses signals were the result of pulsars — neutron stars whose magnetic field beam in our direction like a lighthouse as the neutron star rotates. Flash forward to today, and history seems to be repeating itself. Astronomers have once again discovered something very odd: extremely bright and short radio (nonperiodic) pulses from the sky. These have been dubbed “fast radio bursts.” As of this article, we’ve detected eleven bursts, but we’re still not sure what is behind these strange signals. Theories have again ranged from terrestrial noise to signaling aliens. Today’s authors suggest a familiar end to the mystery: pulsars. 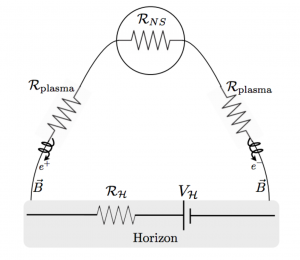 Figure 1: A black hole battery driven by a neutron star. The neutron star’s magnetic field lines (black lines ) carry charged particles to and from the surface of the neutron star using the emf generated by the black hole. Unlike pulsars, which can be detect without a stellar partner, pulsars which cause fast radio bursts will need friends. Specifically, they need to be in a binary with a black hole. Neutron stars paired with black holes do not behave nicely like Tatooine’s twin Suns. Instead, these massive objects are continuously spiraling towards each other while they irradiate energy as gravitational waves. Eventually the pair nearly touches and the neutron star will be sucked up into the black hole. Seconds before the collision, the neutron star might actually become battery powered! Here’s how: The black hole and neutron star are rapidly revolving around one another, which means that the black hole passes quickly through the neutron star’s magnetic field. 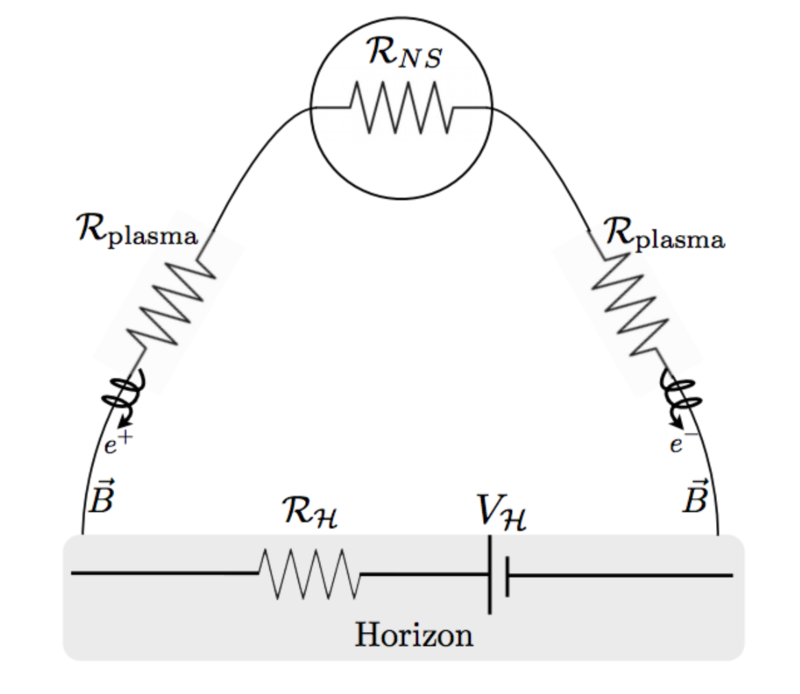 As the black hole moves through this field, it induces an electromotive force (emf) between its own surface and the surface of the neutron star. The magnetic field lines of the neutron star act like wires, carrying charged particles from the black hole “battery” and vice verse. The authors think that the movement of these charged particles releases radio waves. Figure 2: The frame rate of our cameras limits our ability to detect black hole battery systems. The three lines show different frame rates for radio telescopes and how they affect the total amount of light we can capture. 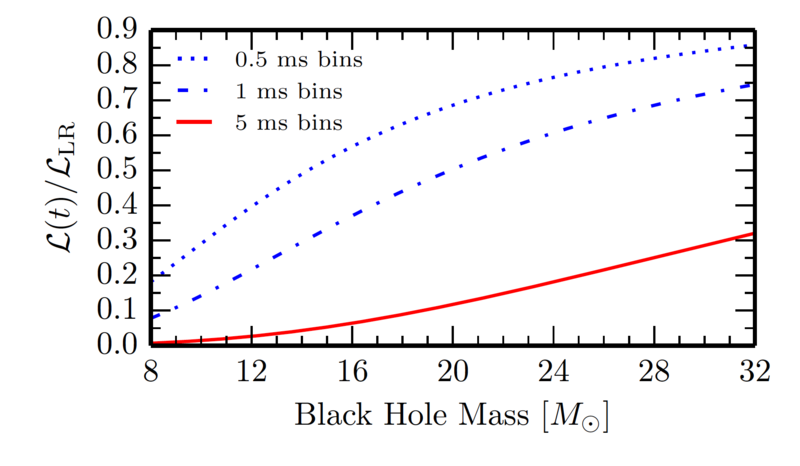 This fraction of light is dependent on the mass of the black hole battery. The battery power increases as the neutron star and black hole get closer together, but the radio waves will only be visible to us for a few milliseconds. The authors point out that this time scale is so short that the time it takes our cameras to click! will affect how much of this battery light we can capture. Figure 2 highlights this effect. So could this theory explain all of the fast radio bursts? Probably not. The authors admit that the black hole battery scenario should occur 1000 times less often than fast radio bursts. However, they might explain fast radio bursts with a distinct feature: double pulses. After the battery runs dry and the black hole absorbs the neutron star there will be a second pulse of radio waves. This theoretical marvel is known as a blitzar. Even if this theory doesn’t explain all (or any) fast radio bursts, this is an astrophysical phenomenon which might very well exist. 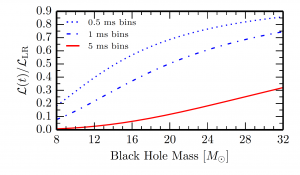 Future theoretical studies can point to other signatures of such a system, and maybe one day we can detect the very first black hole battery.